It’s cookie time! For you new readers, every month, I like to start out with a new cookie recipe. Last month, I made these uber-festive raspberry macaron hearts. Did you get a chance to try them out??? 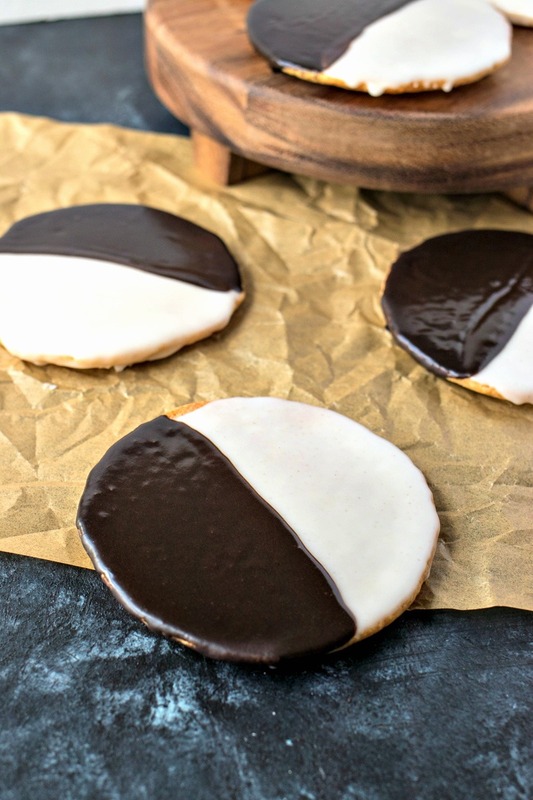 This month I’m making a classic American cookie – the Black & White Cookie. Have you had a black & white cookie before? They became popular in New York City when a local bakery wanted to use up some extra cake batter. They thickened up the batter a little and made cookies out of it and voila! Look how gorgeous they are! I didn’t really know what to expect when eating a black & white cookie. Okay, that’s not entirely true – I expected it to be crunchy like every other sugar cookie that I had before. But other than that, I had zero expectations. Well folks, let me tell ya – crunchy this cookie is not. It’s so cakey and soft and fluffy and lovely. To make sure this cookie comes out cakey and not crunchy, the batter needs to be mice and thick and needs to have a little baking powder. If the batter isn’t thicken enough, the cookies will spread way too thin. After the cookies are done baking, you let them cool completely and then ice with vanilla on one half of each cookie. Once the vanilla icing has cooled, ice it with the chocolate. If you don’t let them cool in between icing flavors, they will bleed together. Do not even think about icing the cookies until they are completely cool. When icing is placed on warm cookies, it melts off. Trust me – you do not want to deal with that mess. When icing the cookies, make sure you let the white icing dry before adding the black icing. Otherwise, they’ll bleed together. Alright, that’s all there is to it! These cookies are gonna blow you away! What cookies are you looking forward to seeing this year – more macarons, chocolate cookies, fruit cookies, more sugar cookies??? Let me know in the comments below! Preheat oven to 350 degrees. Prepare two large baking sheets by lining with parchment paper. Set aside. Add flour, baking powder, baking soda, and salt to medium bowl. Whisk together to combine. Set aside. In a bowl fitted for a stand mixer, beat butter and sugar with a paddle attachment until nice and smooth - about 3 minutes. Add egg and vanilla and beat until just combined. Add 1/3 of flour mixture and beat until combined. Add 1/2 of sour cream and beat until combined. Repeat until flour mixture and sour cream are fully incorporated, ending with the last 1/3 of the flour mixture. Batter should be super thick. Using an ice cream scoop of 1/4-cup measuring cup, scoop cookie dough and place onto prepared cookie sheet with tons of space between cookies. 6 cookies per sheet. Place in preheated oven and bake for 14-15 minutes, or until the edges turn slightly golden brown. Not too long or they'll get crunchy instead of cakey! Remove from oven and let cool for 5 minutes before transferring to wire rack to cool completely. Do not ice cookies until completely cool. Whisk the powdered sugar, 6 tablespoons milk, corn syrup, vanilla extract, and salt in large bowl. Transfer 1 cup of mixture to another bowl. Sift 3 tablespoons of cocoa powder into one bowl and add last remaining tablespoon of milk. Whisk together to make chocolate icing. To frost cookies, start with white icing. Spread icing with an offset spatula on half of each cookie. Set back on cooled baking sheet and place in fridge to let the icing set up for 15 minutes. Once set, repeat with chocolate frosting. Feel free to go over some of the white icing to create a nice, flat edge in the middle. Place back in fridge to set for another hour. Remove from fridge and let them get back to room temperature before serving. Enjoy! Black and white cookies are my absolute favorite! I finally started making them myself this fall, which has been so dangerous – now I can have them whenever I want. Before, I was at least limited to our trips back to NYC to visit a real bakery (because let’s be honest, outside of NYC, they just aren’t the same!). These are always a classic. I love them, but haven’t had them in so long…I think I’ll be making them soon! I LOVE black and white cookies! I always order them when I see them in a pastry shops, but I’ve never tried making them on my own. These look super easy and I will definitely be making them soon! These cookies make me think about New York. When I lived there, I used to buy them all the time at the bakery shop) Great recipe! I agree, they are so pretty! And I love the mixture of the black and white to change up the flavor a little while you eat them. Yum! Such good looking cookies and I’m sure so tasty as well!! These cookies looks delicious! Going to add them to my family dessert menu. I love your recipe and I love black and white cookies. I have to try and make thesethey look and sound fabulous. I have never tried black + white cookies! I am all about simple and delicious. But those funfetti whoopie pies I just saw are a whole other story..yuuuuum! You’re gonna love both of those fabulous cookies! Firstly I will have to come back next month to see your next cookie recipe!!! This recipe is so adorable! My youngest some loves black and white everything. Because it reminds him of his favourite animals, pandas and penguins! So he is going to be super happy to see me make these! Aw how cute is that?! You gotta tell me if he loved the cookies! I’ve seen these everywhere, but, confession time: I’ve never actually tried one! I had no idea it was made with a cake-type batter! The things you learn! I hope you get the chance to try them soon! I love black and white cookies. Such a classic! I have never made them myself, though. Love your step by step photos! Perfect crumb on these cookies. Black and white cookies are perfect for people like me who don’t want to decide between chocolate and vanilla! Oh don’t get confused – these aren’t crunchy cookies. They’re super cakey! Love this recipe. They would be perfect for a classy birthday party, an Oscars party, New Years and more. Great share! I am not a baker so have never dare to make this black and white cookies that I have to confess I adore. Those are so good! I’m obsessed with black and white cookies! We always called them half moon cookies and did a chocolate base, but this would be fun to make too! Ooo a chocolate base would be yummy too!! When I moved to New England and went to NYC for the first time, I was told I HAD to have a black and white cookie. I was never a fan of cakey cookies until I had these – I’m going to have to try your version! That’s awesome!! I hope these stand up to the NYC classics! These look and sound delicious! I can never have too many cookie recipes to try out! I’ve never had black and white cookies before so, like you, I expected them to be crunchy. Cakey changes things!